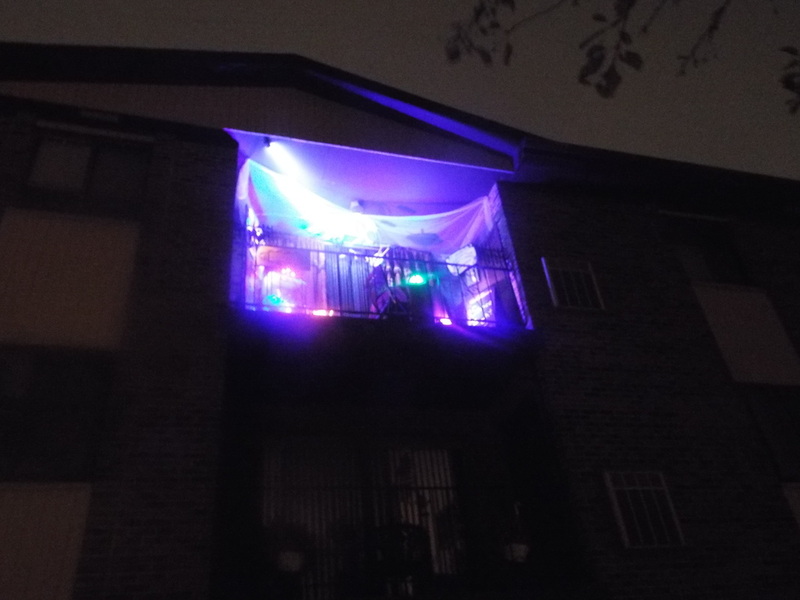 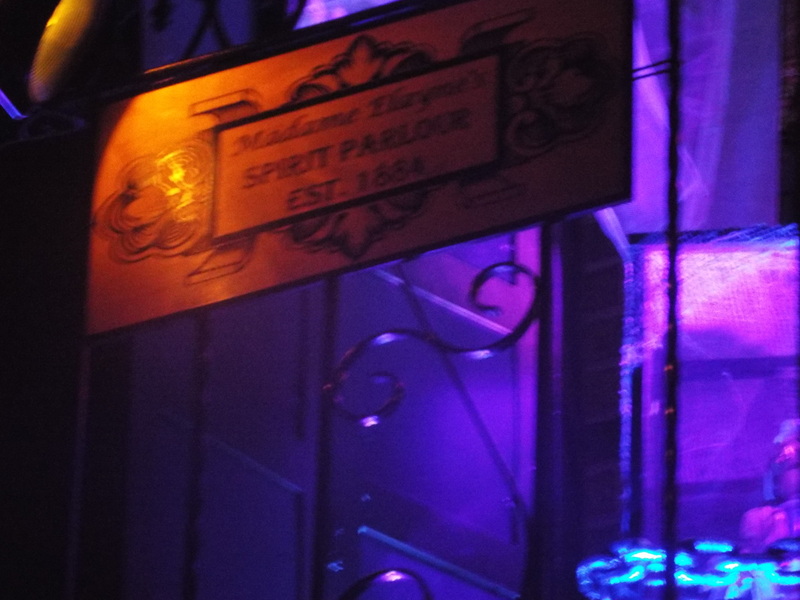 Spirit Parlour de Balcony is a haunt we can definitely say makes good use of space - this one doesn't even have a lawn, but rather a third floor apartment balcony, which it uses to great effect to create different haunted scenes. 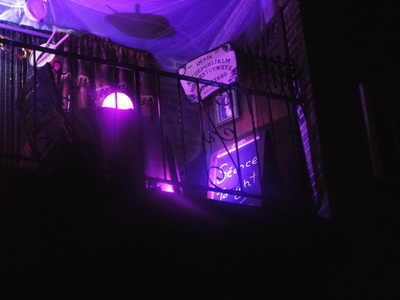 Last year the haunt was called Cemetery de Balcony, and featured (surprise!) 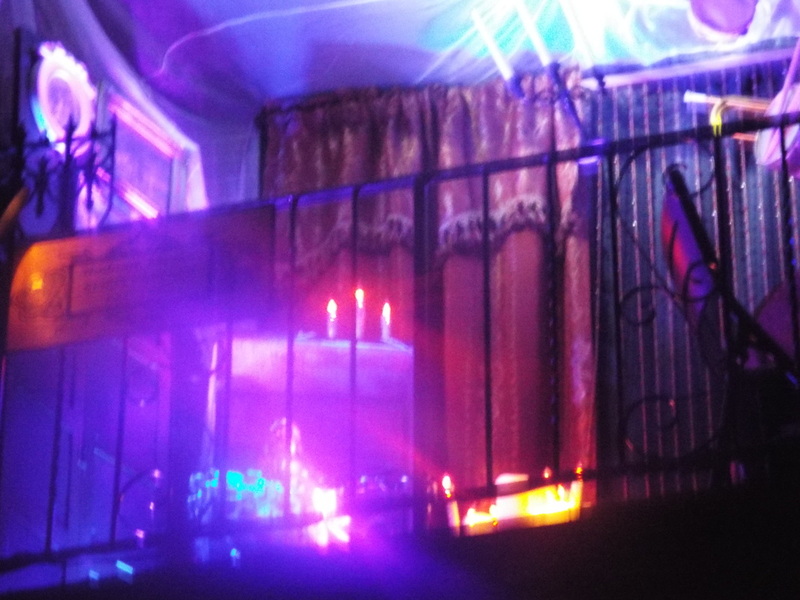 a cemetery setting. This year the display was a little more specific, focusing on a recreation of a turn of the century era seance room that mediums would use to communicate with the dead. 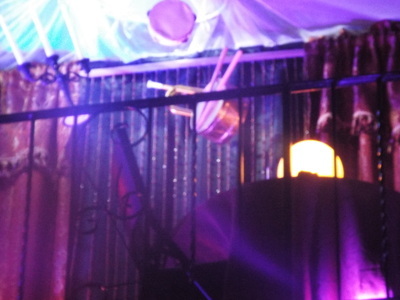 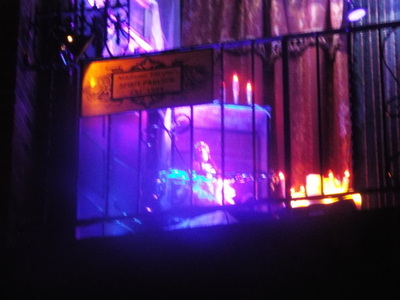 Despite not having much space to work with, the display is quite highly detailed, and depicts a seance in progress, including a chair suspended on an angle, a floating Ouija board, and musical instruments (which in turn of the century spirit parlors were supposedly played by spirits to indicate their presence) suspended above a table as if appearing out of the air. Although the display is static, the clever staging of the props gives it the illusion of movement, as if a visitor had entered the room in the middle of a spirit appearance. 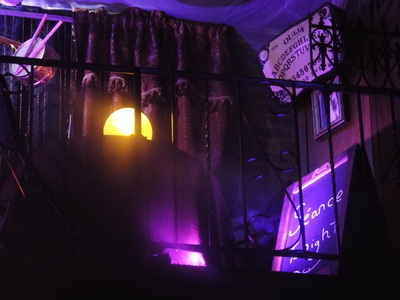 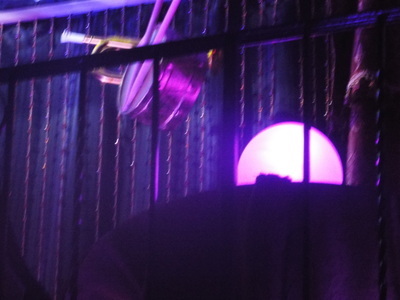 In addition to the main props, there are also other trappings one might expect to find in such a location, including a glowing crystal ball, a candelabra, some vintage photos and velvet curtains on the walls, and even an elaborate sign with the proprietor's name and year of establishment. 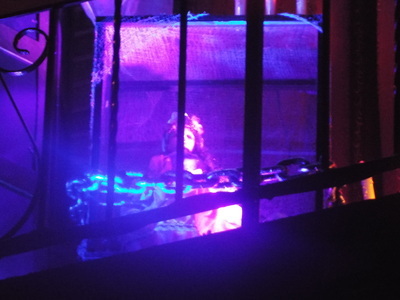 Oh, and we can't forget to mention the creepy doll in a transparent case that is secured with a large chain - odd! In all, there is a great amount of detail to this setup, and all of it is accentuated by some effective lighting that gives the entire tableau an otherwordly glow. 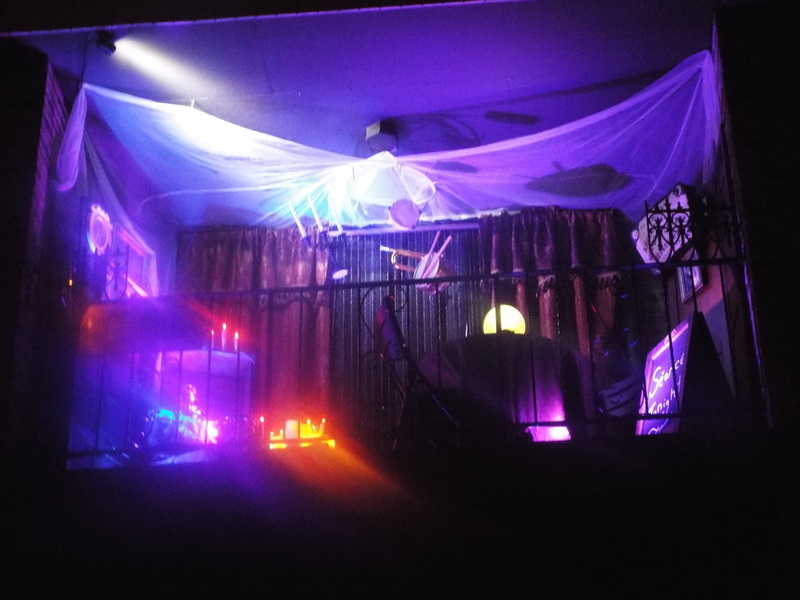 It's quite creative and makes excellent use of perhaps the most limited amount of space we've seen at a haunt. The theme also appears to change form year to year, so we're excited to see what the next incarnation will be!